It may sound harsh, but a lot of us have residents who would rather sit in the lobby and sleep than attend one of our activities. But, no worries. Here are 4 things you can do today! Back Into Your Activity Room Again." After signing up for our free activity tips, check out our how-to articles for simple ways to get your residents excited about your activities again, like How to Get Your Residents to Stay (and Not Leave) Your Physical Activities, which explains the four easy things you can quickly change about your current exercise activities. 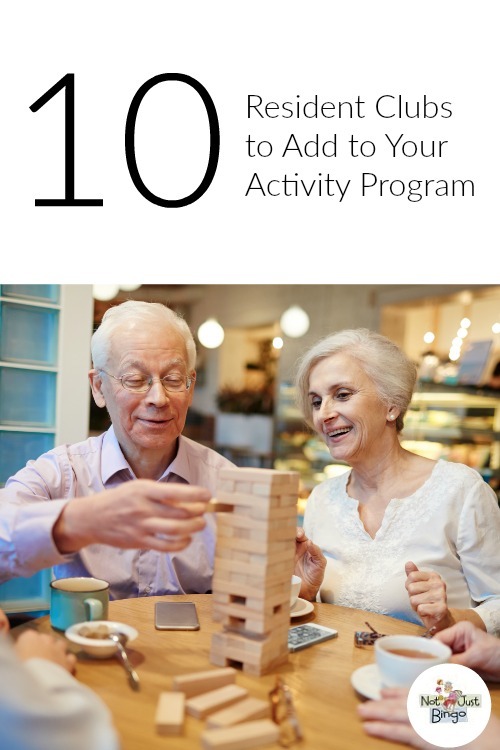 In addition, add several fun resident clubs to your activity program after reading the article 10 Resident Clubs to Add to Your Activity Program, which provides several tips on how to create the clubs. Next, use our Observance Calendars to find unique daily, weekly, and monthly observances and holidays that you can use as inspiration to create your own activities that will pique your residents' interest. After all, why not host a Bird-Watching Party on World Migratory Bird Day (May 11), or organize a Wine Tasting on National Wine Day (May 25). Finally, gather a few more fun ideas that you can easily plug into your monthly activity calendars by checking out the Not Just Bingo membership, where you can access hundreds of fun activities each month that your residents will love! Discover tailored activities for your residents – like reminiscing activities, sensory stimulation activities, bedside activities, and even activities for men.